Al-Arba’een: The Syrian Army received intelligence from MI about a grouping of terrorist rodents from Kataa`ib Al-‘Izza which was attempting to attack an SAA strongpoint to the north of this suburb of Hama. The captain commanding the SAA unit was quick to react and ordered 4 T-72 tanks equipped with the Saraab-2 anti-TOW system to confront the rodents. All of this took place while SAA artillery targeted the rats to soften them up and cause a disruption in their discipline. It was a complete success as the terrorists left 6 carcasses while carrying off their wounded. The dead rodents were all foreigners and did not have papers stuffed in their cargo pockets. One of the carcasses had a documents in Urdu, the language of Pakistan. Qal’at Al-Madheeq: This is in the area of North Suqaylabiyya. An attack was mounted by Kataa`ib Al-‘Izza on SAA positions which resulted in a complete destruction of the cockroaches. The Syrian Army used tanks and delivered the final blow with APCs which delivered a platoon of infantry who engaged the terrorists in gunfire resulting in the confirmed deaths of 3 rats. 7 rodents were taken prisoner and are warbling elegantly for the Air Force Intelligence interrogators. Al-Habeet: This is Nusra territory in South Idlib. Vague reports of heavy fighting with scores of snakes killed or injured. The fight is ongoing. 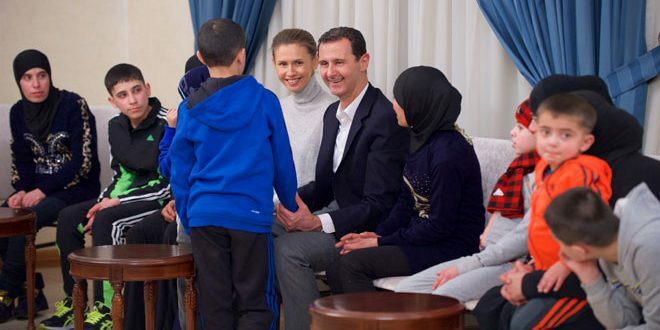 The Syrian First Lady, Asmaa Al-Assad, underwent surgery last Sunday, January 27, 2019, at the Damascus Military Hospital. The First Lady was diagnosed with early stage breast cancer. She recovered very quickly after the surgery and was photographed greeting the parents of Syria’s martyrs. VENZUELA: Will Maduro please get the Supreme Court in Caracas to lift Guaido’s legislative immunity? This traitor must be arrested and brought to justice on the grounds of sedition and treason. I am aware that Maduro has not been successful for the Venezuelan Republic, yet, he remains the president and nobody should be allowed to simply declare themselves president by virtue of colonialist and imperialist forces. Sadly, I do not believe Russia to be as committed to Maduro as she is to Dr. Assad. I could be wrong since word is leaking out that a Russian security team has taken position around Maduro and that Russia is working to back him diplomatically and politically. I will know everything is fine when I see Cuban soldiers coming to his aid. January 31st, 2019 in News. Glad to hear that Asmaa Al-Assad is well enough to get back to work, that is a positive sign. Wishing and hoping for her recovery to be complete. Thanks for a fresh start, Ziad. Thanks for the updates Ziad. I’m with you on the Cuban soldiers. An indication they are not being mistreated. I’m sure they’re getting good, actionable intelligence. Maduro has said that the investigation and arrest/indictment of Guaido is up to prosecutors and the judicial system. Constitutionally, he is not involved but the clear indication is that he wants and expects them to act. Indications also are that they will, but it takes time to do things legally rather than through dictatorship and absolutely corrupted absolute power. The last thing Maduro need is questions about the disposal of the rat. Ziad, tks for the news on First Lady Asma al Assad, her charism travels the world, we all wish her a healthy and long life. As a side note, from the neighbouring Lebanon, the Government was finally formed with all the cabinet names. Hizballah got its 3 ministers, including the Minister of Health, Jamil Jabbak, which the US lobbied to block it until the last minute. The US lost. Congrats Lebanon. Priceless moment when a Russian Su27 takes a NATO F15 for a tango. Incredible scene. I am glad to hear that the Syrian First Lady Asmaa is recovering. Her sweet and gracious nature was apparent in her face when she greeted the children of Russian servicemen that fell in service to Syria. Syria with Assad and the First Lady have the right leadership at the right time to save the nation. They are human and could have made some mistakes but they rose to the challenge and led Syria to victories. The struggle and victories of Syria will be remembered by future generations and inspire others to resist oppression and evil. Uhhuh… sure, kept secret, why? We have arrived to the place where the secretly accused are denied even the right to know what they are accused of. Viva Asmaa and the Doctor. My hope is that many generations of benevolent leadership will prevail in Syria and the surrounding states. The reason for Maduros non-success, (or is it, jsut because the Murikans say so)? are the ongoing illegal sanctions and theft of gold and monies. In his final days as the Israel Defense Forces’ Chief of Staff, Lieutenant General Gadi Eisenkot confirmed, on the record, that Israel had directly supported anti-Assad Syrian rebel factions in the Golan Heights by arming them. Haaretz calls it a big mistake…. ya think? Israel publically admitting they were secretly arming al qaeda and affiliated terrorrists in their bloody sectarian attempt to dismember the Syrian state. The Oded Yinon Plan is a war crime & Israel is a mafia state. Fight for justice and all will be well. Looking forward to happier times. Patrick J. Buchanan – If the Army Stands With Maduro, What Is Plan B? Guido was a scheme cooked up in collusion with Washington, made in the USA, with Secretary of State Pompeo, John Bolton and Sen. Marco Rubio signing on, and President Trump signing off. This was Plan A. But if Plan A does not succeed, and Maduro, with America’s prestige on the line, defies our demand that he yield, what do we do then? What is Plan B? “Assad must go!” said Barack Obama. Well, Assad is still there — and Obama is gone. The US is very actively cultivating Turkish ambitions in Syria for control over regions that were once a part of the evil Ottoman empire, and by doing this it hopes to break the Russian-Turkish alliance over Syria. Russia, Syria, and Syrian Kurds reject the notion of a “safe zone” under the control of foreign powers on Syrian territory. Both Russia and Syria want an unconditional and total withdrawal of US troops from Syrian land. It appears that the empire does not want another summit between Kim and Trump…….. So the PMU and Iraqi gov forces are helping the SDF fight ISIS in Syria, but the remaining ISIS held territory in Iraq remains untouched. Strange , very strange. The geo-politics of this planet have entered the theater of the absurd. Israel can no longer hide behind a fig leaf of denial. It has admitted being in league with al qaeda affiliated head chopping genocidal maniacs. The conspiracy theorists, in this case were just proven right. Israel cannot walk back that admission either, the cat is out of the bag. In what should be a global story, Israel admits for the first time that it armed jihadist “rebels” in Syria — something we’ve been saying for years but mainstream media called us conspiracy theorists. Twitter Bans 2,000 Pro-Maduro Accounts, regarding situation in Venezuela, Twitter announced it joined US-backed coup by taking down 2,000 accounts it said were engaged in “state-backed influence campaign”. Removed 1,196 accounts located in Venezuela which deemed to “appear engaged in state-backed influence campaign targeting domestic audiences.” The company also removed another 764 accounts, but said “we are unable to definitively tie accounts located in Venezuela to information operations of a foreign government against another country.” (MSM’s comprehensive dominance of alternative info available to the masses. When in doubt > delete. Mike). Iran unveils new cruise missile………. A great response would be to base nukes at their bases in Syria………….. Imagine the smile on nuttyahoo’s face. On the UN siding with Madura over Gweedo, first of all it means Venezuela will win this. Second, it shows that eventually the “elite” lose their cohesion and start infighting. None of these f*ckheads like each other, they would rather kill the guy across the table at Davos if they could. Evil always destroys itself. The Russian Ministry of Defense has reported that an S-400 battery stationed in Syria has brought down an F-22 Stealth Fighter. The Russian MOD claims that the F-22 was shot down after it was spotted on radar. The US state department denies that any US aircraft were in the area. But new video footage shows that an F-22 stealth fighter was, indeed, shot down, despite denials by the US government. Well we are a few months early.. If you are a father really concerned with the safety of your own two years old baby child, would you expose him to a dangerous environment? – I blame Maduro for any threat to my baby – Guaidó said to the international press in front of a demonstration in Caracas. So, Guaidó, if you are not a miserable coward capable of hiding behind of your baby, then you just a plain liar. Is this all you have to offer to the Venezuelan people? Venezuelan military Colonel Garcia was exiled for trying to instigate pro-US coups in Venezuela. After spending time in the US, he was smuggled back in to Venezuela by the CIA to try to split the military from Maduro – where he was promptly arrested by the Venezuelan intelligence service! This guy will be highly connected and know a lot of background info. Other CIA stooges in Venezuela should be feeling a little nervous. Is it time to start a ‘Maduro must go’ collage? Strange bedfellows. A deal with the devil ? A.K.A. I’m still dubious of China’s intentions.